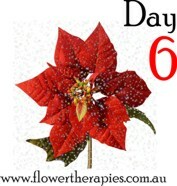 On the sixth day of Christmas, Australian Bush Flower Essences gave to me… Kangaroo Paw (Anigozanthos manglesii). Wow, up to the halfway mark already! But we’re not slowing down yet, as we are today going to look at the more social aspects of Christmas, since it is the time of year when we are most likely to interact extensively with others. For some of you out there, this can make the festive season a very uncomfortable time: it’s often easy enough for us to interact with others on a professional day-to-day basis in the workplace, but having to interact with others using our ‘real’ persona can be incredibly awkward and uncomfortable. That’s where today’s Australian Bush Flower Essence, Kangaroo Paw , comes in. If you look at the flower itself, you will see that it even looks awkward – and almost seems like it can’t decide if it prefers to be red or green! If you didn’t know it was safe to handle, you might even be reluctant to touch it – but if you did extend yourself to it, you would realise that it is actually quite soft, enjoyable to touch and quite elegant in its own way. These aspects of the flower mirror the personality difficulties that it assists with, as it helps you to present the softer inner-side of yourself to those around you, despite the fact that you might often appear as awkward, clumsy and possessing a perennial case of ‘foot-in-mouth disease’! Christmas brings with it many fun opportunities, but your level of fun is going to be governed by how comfortable you are with other people and how well you understand and relate to those around you. If you are the sort of person who: doesn’t feel they can be themselves around other people; feels petrified at the idea of making ‘small-talk’; or doesn’t know what other people expect of you so don’t know how best to act, then Christmas parties and other events might be an almost painful experience for you. So today I thought we would look at some ways that you can use Kangaroo Paw Essence to enhance your social opportunities this season and also to act as a ‘social lubricant’ to make all your obligations run smoothly. Developing and maintaining tactfulness: Tactfulness is a learned behaviour, so if you happen to have been in the presence of parents whose social skills were a little lacking, you hopefully will have had a mentor elsewhere in this skill. If you didn’t have anyone to help you learn this concept, then you might very well be the guest at the party who walks up and introduces yourself to the female host of a party, only to find yourself embarrassingly congratulating her on the impending birth of her child when she isn’t even pregnant! Kangaroo Paw Essence is a wonderful remedy for helping you to develop your level of tactfulness, and ensures you don’t accidentally say the wrong thing and simply ‘blurt’ out the first thing that comes to mind when conversing with others. After all, often we only lack tactfulness due to discomfort when interacting with strangers, so with Kangaroo Paw Essence’s help, take a deep breath, think before you speak and you will become the life of the party! Being sensitive to people around you: There are so many benefits to being sensitive to the needs and personalities of other people around you. Not only do you enable people to be themselves around you, thereby creating the opportunity to form meaningful friendships, but you also get the opportunity to really understand what other people are communicating to you. Instead of just nodding and making mandatory conversation, Kangaroo Paw Essence can enhance your level of sensitivity to the people you are interacting with, and enable you to not only hear what they are saying, but really understand what they mean as well. Creating a more sensitive you: Christmas allows you the opportunity to extend the softer, kinder side of yourself, and Kangaroo Paw Essence enables you to bring this to the forefront more readily. Now for some people, the idea of having a ‘softer side’ might imply that you have a weak side: quite the opposite. You can be soft and yet still powerful, sensitive and yet assertive. Kangaroo Paw Essence enables you to develop your ability to feel and understand how you are being intepreted by the people around you, and ensures you present the best side of yourself to everyone you meet. This is truly an Essence we can all use at some point in our lives, as interacting positively with other people presents a great challenge all our lives. Whether it be because of a particular life stage or a critical time in your life, there is always a period of time in which you find yourself unable to interact with others in a sensitive and emotive fashion. Kangaroo Paw is such a wonderful Essence as there is always room within us for being more sensitive, and above all else, it encourages you to be more sensitive in your most important relationship: that you have with yourself. I hope you enjoyed our sixth day of Essences, and I look forward to you joining me tomorrow for Day Seven (subscribe here to make sure you don’t forget the rest of the series!). I would love for you to leave your comments below about this post & if you would like me to cover any particular topics or questions in future, just send your request through via my website.